Want to be a part of Filmfare award night? 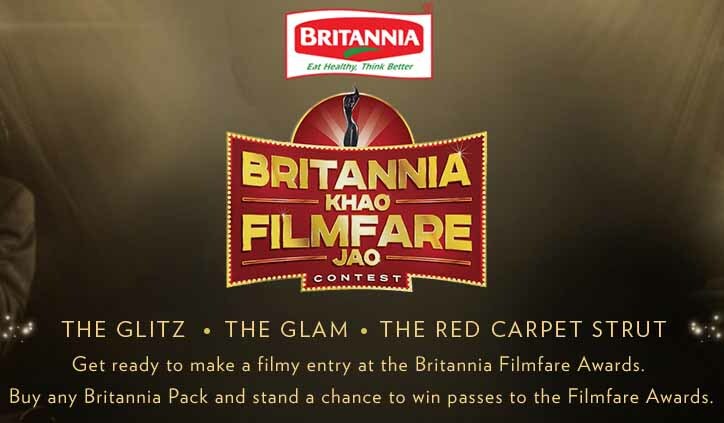 Britannia is giving you opportunity under his 2016 contest “Britannia Khao Filmfare Jao Contest” and here on this page I am going to share details how you could participate in “Britannia Khao Film Fare Jao Contest” and other important information regarding the this contest. Britannia Khao Film Fare Jao contest is already started from 11th December 2015 and it will continue till 12th of January 2016. So, if you have not register yourself by using online facility, Missed call or SMS. People below 18 yearsduly represented and accompanied through their parent or legal guardian (who is above 18 years of age) shall also be allowed to participate by providing the necessary documentation on behalf of the minor. In such a case, the parent or legal guardian of the minor may redeem the prize at his / her own cost and shall execute the documents as required. As a first step, Participants are required to give a Missed Call to 8767116711 from any GSM or CDMA mobile phone. Once a Participant gives a Missed Call to 8767116711, in response to that Missed Call, the Participant will receive an SMS with respect to the contest. All Missed Call entries will be validated; however the Participant will stand a chance to be declared as a winner of that week subject to further scrutiny/verification to be done by the Agency Appointed by BIL as mentioned below. Due to technical or non-technical reasons, in case the Missed Call is not considered as an entry for participation; the Agency or BIL will not be liable for the same. If the Missed Call is sent from a Landline in India/or any landline or mobile number outside India the Missed Call shall not be treated as a valid entry and/or the Participant will not get SMSconfirming entry. (i) As a first step, Participants are required to give a Missed Call to 8767116711 from any GSM or CDMA mobile phone. (ii) After Participants gives a Missed Call to 8767116711 to during the Contest Period they will get a question to answer via an SMS response. (iii) Participants will be required to send SMS in the following format: FILMFARE followed by their answer to 8767116711 to complete participation. (iv) After sending the answerby SMS, Participant will get SMS with respect to the Contest. (vi) All SMS entries will be validated; however the Participant will stand a chance to be declared as a winner of that week subject to further scrutiny/verification to be done by the Agency Appointed by BIL as mentioned below. (vii) Due to technical or non-technical reasons, in case the SMS is not considered as an entry for participation; the Agency or BIL will not be liable for the same. (viii) If the SMS is sent from a Landline in India/or any landline or mobile number outside India the Missed Call shall not be treated as a valid entry and/or the Participant will not get SMS confirming entry. The participant shall have to pay standard SMS charges as per the mobile plan he/she subscribed to their respective telecom service providers for sending the SMS to 8767116711. (i) As a first step, Participants are required to log on to the Contest website www.britfilmfare.com and follow the instructions on the website to complete participation. (ii) Participants will be required to enter their mobile number and City in the format mentioned online. (iii) There will be no charges for entries made online other than the charge to respective Internet Service Providers for the internet usage. (iv) If the Participant logs on to the website after completion of the contest Period, the Participant will be informed that the Contest Period is over and therefore no entries can be accepted. (i) Participants can log on to www.britfilmfare.comand follow instructions on the website to participate in the Contest. (ii) Participants will be required to enter their mobile number and also answer a simple question in the format mentioned online to complete the participation. All Online entries will be validated; however the Participant will stand a chance to be declared as a winner of that week subject to further scrutiny/verification to be done by the Agency Appointed by BIL as mentioned below. How Many Winners Will be Shorlisted & Prize? There shall be total 40 Winners for this Contest. Each shortlisted winner will be eligible to win an Entry Pass for 2 people for the Filmfare Awards happening at Mumbai. 10 Winners will be announced end of every week during the Contest period. Winners will be chosen / shortlisted through a computerized random selection by BIL or the Agency appointed by BIL. Travel (Pick up and drop arrangements in Mumbai) and stay (as per the requirement)will be organized by Britannia or its agency. The winner shall adhere to the same and not demand for change of the arrangements made. (i) A draw through scientific random selection will be conducted every week. (ii) Winners for 1stweek will be selected on the next Monday from the pool of valid entries (Valid entries means entries received between 00:00:01 to 22:59:59 of all seven days) received during the first week. (iii) The same process will be followed for winner selection of weekly winner throughout contest duration. (iv) The prize will be an entry pass to FILMFARE awards for two people. (v) Prizes will be given subject to the winner satisfying the verification process of BIL and upon submission of relevant documents to Agency. (vi) The Prize cannot be transferred, exchanged or redeemed for cash. In the event that the winner does not take the prize in the time and manner stipulated, then the prize will be treated as cancelled / forfeited and cash will not be awarded in lieu of the prize. Prizes must be taken as offered and cannot be varied. Any unused prize is non-transferable, and non-redeemable for other goods or services and cannot be considered in exchange for cash. (vii) BIL or its Agencies shall not be liable for any loss or damage of the prize due to Act of God, Governmental action and other Force Majeure circumstances and / or for anything happened beyond control of BIL / its Agency, and shall not be liable to pay any compensation whatsoever for such losses. (viii) BIL will not be liable or responsible for any damages, losses, costs, expenses or otherwise suffered by any of the Winners and/or companion during the course of the Filmfare event/travel. (ix) Any participant of the contest who wins a prize during the contest Period shall not be eligible to win any further prizes. (x) The winner generation will be done on the basis of unique mobile number / SMS response (wherever applicable) + Britannia Product Original Wrapper + unique Photo Identity Proof of Contacting Winners + any other documents required by BIL / its Agency. Hope you get everything here so what are you waiting for just visit www.britfilmfare.com and participate today in the contest. Incase have any query just drop it in below box and can read detail term and condition of Britannia Khao Filmfare Jao contest online on the official site of www.britfilmfare.com.